That language is consistent with treaty obligations under the 1967 U.N. Protocol Relating to the Status of Refugees, to which the U.S. is a party. By now, most everyone has seen or heard that another Obama-appointed lefty judge has taken it upon himself to determine that thousands of illegal immigrants can enter our country and ask for asylum. This decision makes it glaringly apparent that they don’t give a tinker’s damn about this country, so long as they get to issue rulings that counter Trump. There’s no way of knowing how this will turn out, and much of that will depend who’s on call in the 9th Circuit when this gets to them. There’s 15 judges in the 9th and Trump has appointed a couple of new ones, but it’s still full of old holdovers from Obama’s reign of terror. On top of that, he stated today that the 9th is a disgrace, so that probably didn’t help matters any. If word of this gets to those groups helping the caravan, they could advise them to try and enter at places other than the ports of entry. Will they do that? My guess is yes, they will. Those illegals will be crawling like ants to every spot they can find to cross over into the US. The ACLU attorney is an idiot to say we’re denying them rights – they don’t have rights and we ARE letting them apply for asylum. This could be disastrous for our Border Patrol and others on the border right now. May God help them hold the line. There are 9000 more approaching us through Mexico. Rights? These people do not have our Constitutional rights. They are aliens. I am so sick of these lunatic elitist judges who only want to play political upsmanship and organizations like the ACLU who are America haters. Wish I knew how to rid ourselves of these people. We are so lost. does anyone know the Constitution? Mexico should stop those from coming before they have a war on their hands between the Mexican citizens and the people in the caravan. 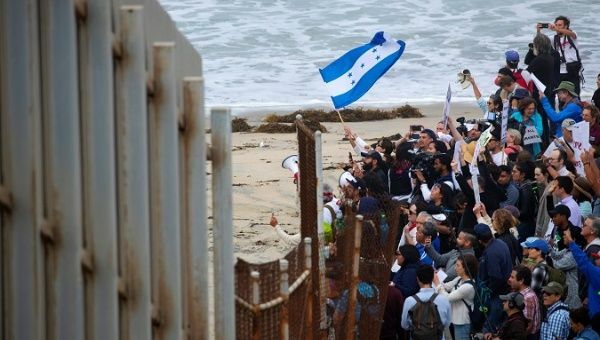 Tijuana is already mad and deporting some that have broken laws, and the other towns may not be as helpful as they were to the first one. The ACLU and some of these judges need to go the way of the dinosaurs. Unfortunately, the judge was 100% correct on the law, which was passed by a Democrat-controlled Congress in 1994 and happily signed by Bill Clinton. Per the Constitution, the Supreme Court is a branch of the government that is CO-EQUAL with the President, not superior. Certainly, no inferior court has status or authority equal to SCOTUS. Therefore I see no constitutional reason why the President, in this case Trump, is bound by any holding of any Court other than SCOTUS. Secondly, this phenomenon of District, or lower, courts issuing rulings with national effect is completely new. The only court with national jurisdiction is SCOTUS. Lower courts have jurisdiction within defined geographical boundaries, and their rulings only apply WITHIN those jurisdictional boundaries. In fact, that’s one of SCOTUS’s main functions: to settle conflicts between the rulings of the various Districts in order to assure uniformity of the application of law throughout the nation. With that in mind, barring a SCTOUS ruling, I maintain that Trump – or any President – can tell that lower court judge to stick it where the sun never shines. In the case of Worcester v. Georgia SCOTUS handed down a ruling that Jackson chose to completely ignore. Though this resulted in the Trail of Tears tragedy, it did illustrate the principle that SCOTUS doesn’t have authority superior to the President. Great explanation and thank you for adding that, Brian. This is something that’s puzzled me every time one of these left-wing judges hands down such a backwards ruling. The question is, why don’t the very-smart-brained people in Trump’s admin, the DOJ and the DHS already know this? They should be making a statement to that effect to the people, instead of throwing their hands up in anger. The other thing I wonder about is how and when this has an effect on the actions of the Border Patrol. Do they immediately stop their limited asylum requests or carry on until SCOTUS rules on it? Since we didn’t elect the ACLU to run this country, I’d think they could continue as they were. Judas Roberts is denying that there even are “political” judges. I’d seen Roberts’ statement earlier and it’s about what we’d expect from him. Imo, in his position, he has no business commenting one way or the other, so kudos to Trump on the pushback because he’s absolutely right. Roberts says the judges are ‘independent’ but if that were true, they wouldn’t be the go-to court for lefty activists and lawyers. Judas is fitting, and he proved that when he ruled obamacare was a tax, instead of killing it like he could have. Yep, the Obamacare ruling is when I started calling him Chief Judas Roberts. No doubt it should, and right now I’d say the lefty judge, the ACLU, etc are accomplices. This thing is a ticking time bomb while they pat themselves on the back for getting one up on Trump. Idiocy knows no limits. As we fall further and further down the rabbit hole…..
My thoughts exactly, CW, I almost commented that we’re just about to hit the bottom of that hole. Our president seems to have an amazing ability to make judges who don’t want our country protected show their true characters. True, foguth, I just wish the lefties would get over the bad attitude and see that these actions are dangerous to all of us. Me, too, Kathy, me, too.